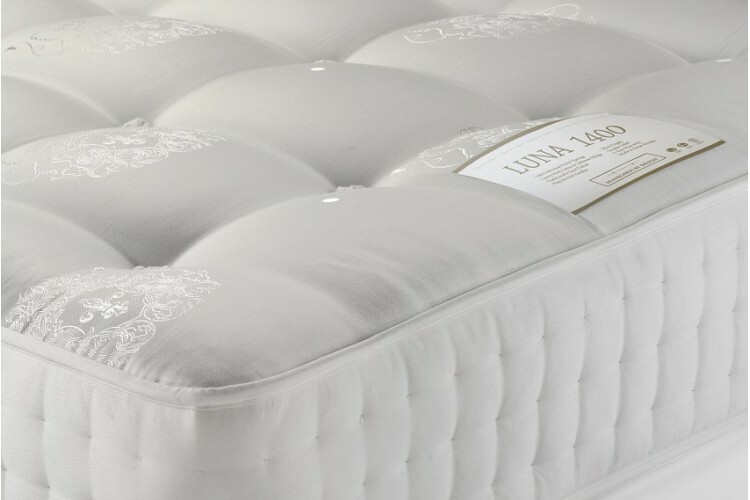 Filled with a healthy combination of cool cotton,wool and cashmere, you can rely on the Luna 1500 to deliver an extra comfortable night’s sleep. The Luna mattress, with 1500 pockets,is designed to reduce the transference of movement between partners. The pocket springs are ergonomically designed to provide excellent orthopaedic support. Hand Side Stitched Mattresses are made using a long upholstery needle. It is made by stitching the perimeter edge of springs, the fillings, and the fabric border of the mattress together. This is a traditional process that is only in the realms of the highest skilled craftsmen and can only be completed by hand. This technique is very time consuming but pays dividends as will increase the lifespan of a mattress and offer edge to edge support. With a super soft Cotton Damask cover , perfectly placed handles, vents and hand-tufted buttons, the Luna 1500 mattress is utterly luxurious.